The past year or so, especially the past few months, has seen a huge wave of new naval warfare games. First we have two card games, Phalanx Games’ ‘Naval Battles’ is a great WW2 game of naval combat and covers carrier combat as well as submarines. Secondly is Decision Games’ second title from their ‘Lightening War’ series, ‘Midway’. Neither game is a simulation by any stretch but both are fun, fast playing and have a nice naval feel to them. Omega Games redid two older naval games and released them as new titles. There is the WW1 ‘Line of Battle’ and the WW2 ‘Battleship.’ Both titles focus on combat between capital ships but also include smaller vessels as squadrons. I believe it was early in 2006 when Avalanche Press finally released their huge Leyte Gulf game, ‘Second World War at Sea: Leyte Gulf.’ It is a massive game with dozens of scenarios and hundreds of counters that covers the entire battle using their SWWAS system. Avalanche Press then followed up ‘Leyte Gulf’ recently with ‘Jutland,’ another ‘Great War at Sea’ title. This is a remake of the original and follows the rest of the line in quality and play. Against the Odds magazine published ‘Imperial Sunset’. ‘Imperial Sunset’ is a great operational level game of the Battle of Leyte Gulf that uses a chit draw system to keep surprise high without any bookkeeping. The game strikes a great balance between playability and simulation and the victory conditions give the Japanese a chance to win. This was the first ATO magazine game we had seen and we were very pleased with the quality of the rules and components. There were some errors in the ship record sheets but you can get corrected ones as well as the latest addenda from their site or off ConSimWorld. Recommended. GMT Games re-released the award winning ‘Empire of the Sun’ card-driven, board wargame. EotS is a great strategic level game of the entire War in the Pacific from the attack on Pearl Harbor until the surrender of Japan. The card system makes the game very re-playable and challenging for both sides. Also re-released was Columbia Games’ ‘Pacific Victory’ with new 2.0 rules. PV is a block game and is a good, quick, strategic level Pacific War game. The block system also provides nice, easy fog of war for this game. There is another game that, while released in 2005, certainly deserves a mention on this list. 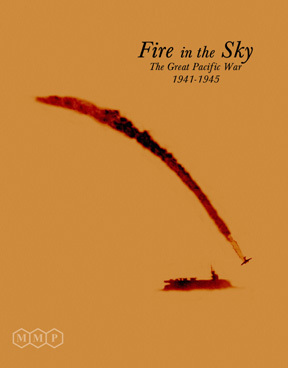 That game is ‘Fire in the Sky‘ by Multiman Publishing. FitS is a wonderful strategic level game of the War in the Pacific. It has great components including a well done map and luscious 1″ counters. Best of all, FitS can be completed in a single game session and is well balanced. Recommended but unfortunately long out of print. On the miniatures front, Decision Games also released ‘Battle Stations, Battle Stations!’. BS! is a nice set of quick play naval rules that cover all aspects of naval warfare, including carrier warfare, in only 20 pages of rules. It has a nice feel to it and includes a number of nice scenarios as well. Recently released was Mongoose Publishing’s ‘Victory at Sea’ rules. VaS is another nice set of quick play rules and is based off of their ‘Babylon5: A Call to Arms‘ ruleset. Mongoose also released a set of ship counters similar to their B5:ACTA counters so you can even play without miniatures. If you are looking for some naval games where you spend more time playing and less time bookkeeping then look no further than these two titles. We have a comparison of these two rulesets. Perhaps one of the classic naval miniature rules was also updated this past year. ‘General Quarters III’ is now available [see our review]. It is being published by Old Dominion GameWorks. GQ used to be considered fast-play rules but compared to BS! and VaS they are quite detailed. But GQIII is more detailed than previous versions but is still relatively quick playing and probably gives more accurate results than the other quick play titles. While on the naval miniatures topic we should probably mention GHQ’s 1/2400 Micronauts ship miniatures. These are probably the best ship miniatures available — Not the cheapest but the best. If you want to go small there are the 1/6000 Figurehead ships. For aircraft our favorite miniatures are CAP Aero 1/1200 minis. These are about as small as you can get yet still be recognizable at game distances. We base all of our stuff on custom plywood bases from Litko Aerosystems. And the computer gaming front has not been quiet either, Storm Eagle Studios released ‘Distant Guns: The Russo-Japanese War at Sea.’ DG is a nice real-time simulation of naval combat during the Russo-Japanese War. It includes a unique interface that makes commanding your ships easy once you get used to it. And if all of that was not enough, Matrix Games announced it is remaking the classic computer game ‘Carriers at War.’ CaW was one of the best operational level, naval warfare computer games of its time. We have high hopes for this one. We do not know why there has been the sudden deluge of naval wargames but we like it! Also see A Wave of New Naval Warfare Games. This entry was posted in Board Wargames, Computer Wargames, Miniature Wargames, Naval Warfare, WW1, WW2.